How do we say goodbye to a show that’s given us so much in such a short time? We’ve learned how probation works, what not to wear to a Crips wedding, that you can trade cell phones for heroin in prison, that “Meet An Inmate” websites exist, and (my personal fave) how to look up random convicts on www.offender.state like it’s a full time job. Oh, Love After Lockup! You’ve given me so much, so I’ll repay you with this final recap. Goodbye for now, and we’ll see you again when WeTV rounds up a new herd of convicts and their delusional pen pals to light up our lives again. Until that day, I won’t forget you. Like Alla says in her creepy card, our love is truly UNDISTRUCTABLE. It turns out that next Friday is the season finale of Love After Lockup, so we have one more week of this wretched awesomeness in our lives. After that, we’ll be forced to mope around until 90 Day Fiancé (all four versions of which have been renewed!!!) comes back to fill our snarky little hearts with K1 Visa love. And even though this debut season of LAL was a mere 7 episodes, it served up enough drama to last us an entire aggravated assault prison sentence (which is approximately 6-18 years, according to our fair felons). This week, Andrea takes the Crazy Bananas Crown back as she berates her children for questioning her relationship with a convicted felon, who she drags them halfway across the country to meet, then forces/bribes them to call “papa.” Thus, it’s official: Andrea is a garbage person. Side note: All three of Andrea’s children are approximately 4 trillion times more mature, eloquent, and intelligent than their mother.The friends and relatives of the rest of the crew try to warn them about their equally doomed relationships, to absolutely no avail. Because that is mission f**king impossible with this crew. And just when we thought Scott was the most tragic figure of all, Alla steps in this week to bring the seriously sad story of relapse. Even perma-crazy eyed James figures out that all is not well in Alla-Land, which is saying something. Sigh. This show needs a hero! Or Dr. Phil. Until then, we’ll just recap the stankfest. 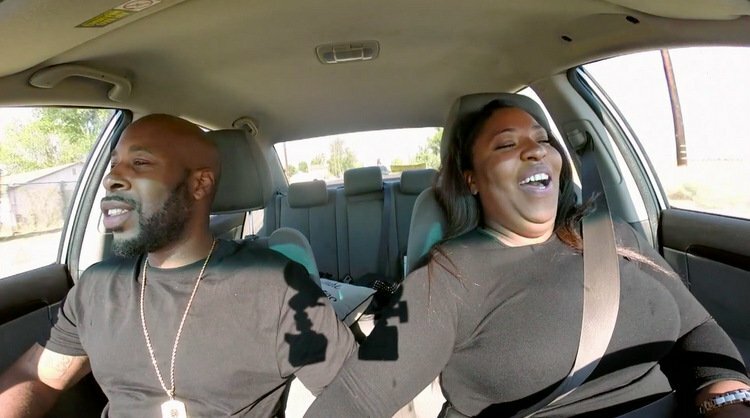 Only five episodes in to the first season of Love After Lockup, and it’s already been renewed for season two! Yep. Producers are hard at work scouring the nation for more deluded singles looking for love behind bars. A tip of the hat to you, WeTV! I can’t wait to say “I knew ye back when…” Also, thank you for making me feel better about my life choices every day. Because after watching this mess, it’s impossible to think you’re not #WINNING at life. This week, probation is the name of the game. Who’s on it, who’s off it, and who ain’t never getting it (hi, Lizzie!). While some couples celebrate the next chapter of their tragic doomsday story, others are saved from themselves by way of the Federal Corrections Agency. There is so much mud to trudge through this week, let’s get right to it! It took a full 24 hours for me to process the cornucopia of dysfunction that this week’s Love After Lockup dished up. Truthfully, I’m still not fully recovered. Much like our beloved 90 Day Fiance, we find that our star-crossed lovers get infinitely messier with each passing week. The joy of prison release day only lasts for so long…like, a literal day. Then it’s everybody into the crazy pool, sink or swim! While Johnna and Garrett continue their bickering over him wanting his “freedom,” Andrea shows Lamar just how scared he should actually be of her when she goes full scale psycho at his homecoming party. James tries to get Alla employed, but she’s too “sick” to show up (ironic quotes intentional), and Mary is in for a rude awakening when picking up Dominic. It turns out he’s happier to see her parents’ old faces than her new one! Lastly, we’re treated to a new couple: 46-year old chain-smokin’, therapy-givin’ Angela and her 32-year old prison fiance, Tony, who she met while trolling the inmate websites. As one does. Only one hitch: She sent Tony a pic that was photoshopped within one millimeter of becoming a Farrah Abraham selfie. Thus, Tony’s in for a big surprise on release day. Pop your popcorn. Let’s get to it! I said it before and I’ll say it again: The inmates are not the crazy ones on Love After Lockup. Their fiancés are. Although Andrea runs away with the crazy-bananas crown this week, I have a strong suspicion that this dubious honor will rotate equally among the cast mates all season long, which of course makes this show the absolute gold mine it is. This week, Garrett bought a car with some mystery fund his grandma gave him, blowing Johnna’s chances at the One-Carat-Solitaire-Stone! she’s dreaming of. Johnna had no bitmojis available to address the situation, so she just scrunched up her face and pouted. Trucker Scott attempted to pick up his con woman fiancé Lizzie upon her release date but – oh snap! She was nowhere to be found. #WheresLizzie? More importantly: #WheresScottsMoney? Alla introduced James to her family, and James introduced Alla to his judgy-eyed friend, Chris. We were also briefed on our next couple, Canadian Mary and her incarcerated fiancé Dominic, who only grabbed 7 minutes of camera time – but somehow managed to fill those 7 minutes with some glorious arguments, drug-encrusted jackets, and a denied conjugal visit. 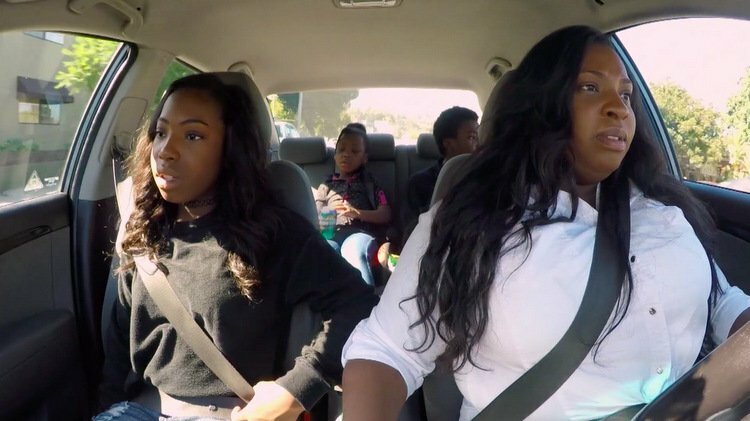 But first, we must talk about Andrea and Lamar because, well, we just have to deal with this troubling carwash situation. My god. For those of you who are embarking on this journey with me, I salute you! (I’m sorry, and you’re welcome.) 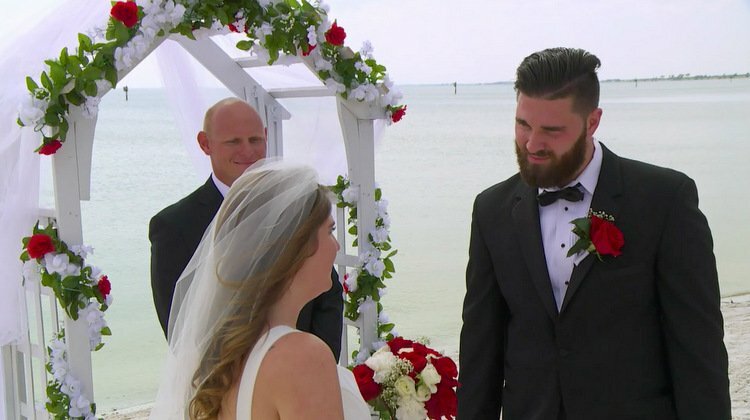 We’re only two episodes in to WeTV’s newest experiment, Love After Lockup, and I already want to leave my family to fend for themselves for an entire weekend of hotel-binge watching. Alas, we’re gonna have to wait a miserable seven days between shows to see where this disaster heads next. Prediction: This elevator is going ALLLLLL the way to the bottom. 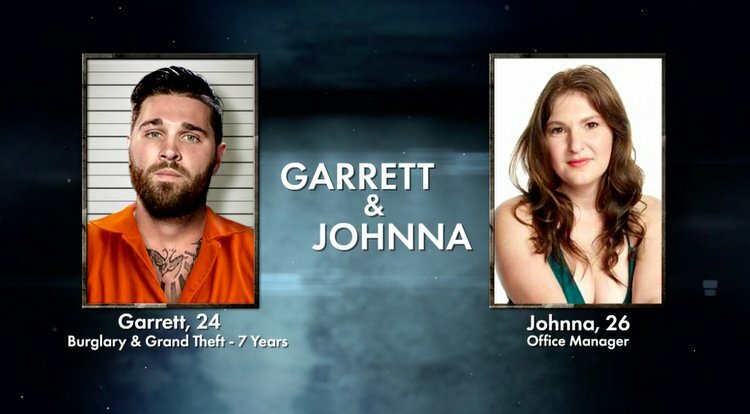 Johnna’s elevator doesn’t seem to go all the way to the top, however, which we learn as she plays house with her freshly-released felon, Garrett, who’s been locked up since he was 18 years old. While he was on the inside carving shivs from plastic sporks, Johnna was in Tampa, FL, buying a house, clothes, and an iPhone stalking device for Garrett. One problem: He doesn’t really know how to use any of these. Also, he doesn’t know just how much of a psycho Johnna is. Ah – but he’s about to find out! Yes, this is actually happening, people. Friends, Romans, Countrymen – lend me your sanity! 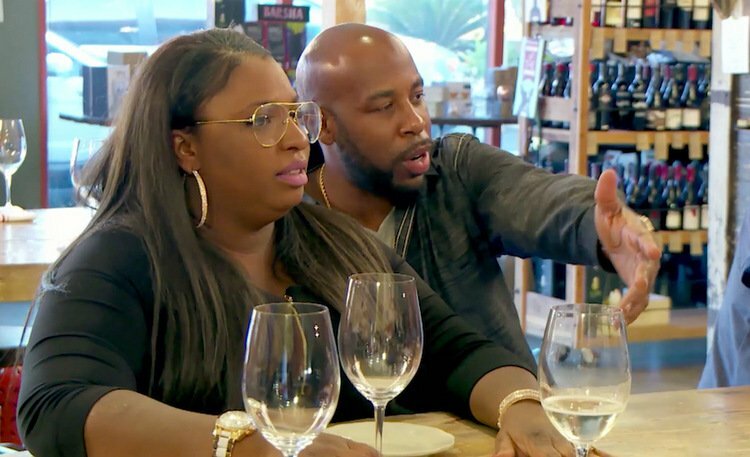 Because we are in for a ridiculously craptastic treat with WeTV’s newest experiment, Love After Lockup, which follows six engaged couples who try to make their relationships work once their prison fiances are released. Since most of the couples met and became engaged while one of them was incarcerated, they’ve never lived with one another on the “outside.” Now they’ll be financially responsible for their prison boo, will have to keep them within the bounds of probationary requirements, and of course, integrate them into their totally freaked out families. Think of it as a K-1 Visa with even higher stakes and more deranged people! Essentially, it’s my favorite kind of sh*tshow. 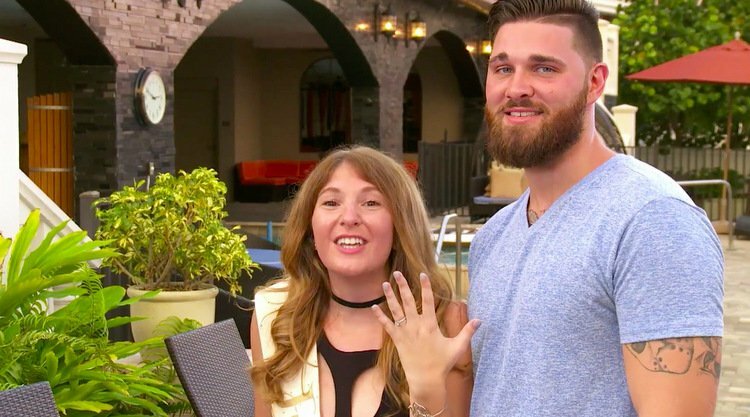 To make matters infinitely better, Love After Lockup is brought to us by the same producers who delivered the diamond encrusted gold nugget of trash TV known as 90 Day Fiance (TLC). This is the stalwart team who scours the planet on the reg, finding hopeless romantics willing to bare it all on cable networks. And I am telling you right now: They are not letting us down with this new project. One episode in, and I already feel like I’m living my best life. Again.